Leading Manufacturer of copper bath tub from Moradabad. We have established our name as one of the trusted Copper Bath Tub Manufacturers in India. 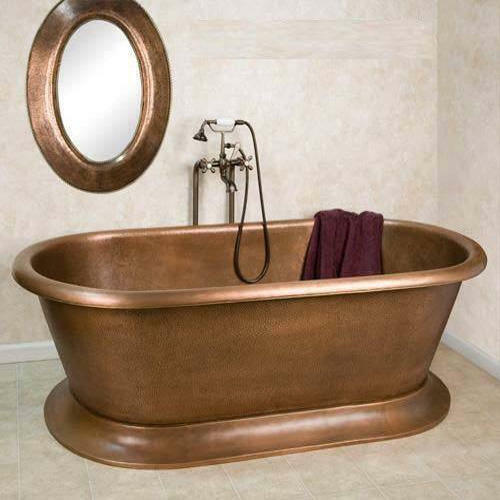 If you are looking to spruce up your bathroom décor, then our Copper Bath Tubs are a great choice. We also offer Metal Bath Tub in different designs and styles. For people who are tired of the same old boring ceramic bath tubs that are common today, and are looking for an exclusive accessory for their bathrooms – our range of Copper Bath Tubs are just what you need. As competent Designer Bath Tub Manufacturers India, you may also tell us if you have any particular design in mind and we will build it accordingly. Our Copper Tubs are made by expert craftsmen by hand; thereby each of the tubs we offer is unique in itself. With our classy looking Metal Bath Tubs, you can create a luxurious looking bathroom. Available in unique designs to suit individual preferences, the Copper Bath Tubs are a class apart from the regular ceramic tubs. Made in our world class manufacturing unit, the Copper tubs are flawless in every aspect and provided at competitive rates. All these tubs require is some regular cleaning with mild cleansers to maintain their luster and finish. We understand that custom designing your bath tub comes with lots of questions, so please feel free to contact us. If you can dream it, we can build it. Hammered copper exterior and interior with smooth, flat rim. Exterior features floral accent bands at top and bottom of tub. Tub dimensions: 65-1/4" L x 30" W (front to back) x 24-1/2" H (± 1/2"). Tub comes drilled with drain hole only. Drain is located in center of tub. Patina is applied with fire using genuine French hot process. This means the color is engrained into the copper, not applied with wax. Luxury finish has been hand-polished. No two tubs are alike, as they are produced by hand. Expect variations in finish and slight variations in dimensions (± 1/2"). Looking for “Copper Bath Tub”?